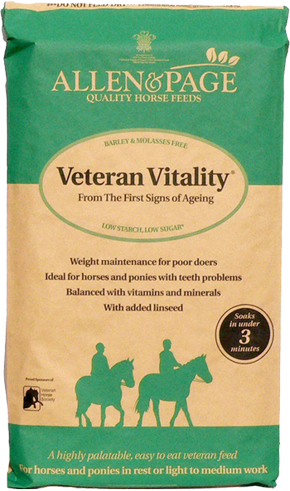 Veteran Vitality has been specially formulated for horses and ponies from the first signs of ageing. 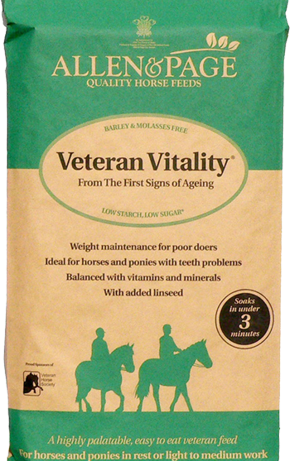 Using only the finest Non-GM ingredients, Veteran Vitality provides all the nutritional requirements for optimum health in older horses and ponies. Veteran Vitality is high in fibre but low in starch, making it ‘kinder’ on the digestive system. A unique pre and probiotic blend, is included to help maintain a healthy digestive system and linseed is added as a source of Omega 3. Veteran Vitality is highly palatable, even to fussy feeders and has a good calorie level to help with weight maintenance. Introduce a new feed gradually over 7 to 10 days building up to the amounts needed to maintain condition and energy levels (0.25 – 5.0kg depending on size, type, workload and condition). Place feed in a shallow bucket, add twice as much water as feed, then stir. Wait 2 to 3 minutes before feeding this product. Dampened, unmolassed chaff or soaked Fast Fibre can be added after soaking. This feed may not be suitable for laminitics – if your horse is prone to, or has, laminitis why not try Fast Fibre? Do not feed to sheep. Our feeds are made from natural ingredients, so occasionally they may change colour slightly through the seasons, or take longer to soak. If the feed is not soaking quickly enough, please leave to soak longer, or soak the feed in warm water, then stir, until it forms a nice soft mash. IMPORTANT, PLEASE READ: To get the best results from Veteran Vitality, please make sure that you do not feed any other products that contain barley or molasses. Many traditional feeds contain barley & molasses which can cause excitability in some horses. Even horses that do not become fizzy as a result of these ingredients can benefit from a low starch and sugar feed such as Veteran Vitality*.